Be Kind – Put this movie out of its misery. BE KIND REWIND looks great in the trailers. In long form, not so hot. Mos Def is an excellent actor. Jack Black is an even better comedy tornado. 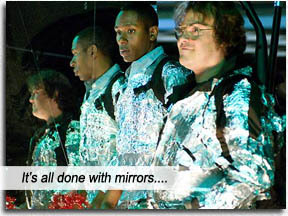 So putting them together in BE KIND REWIND should have begat gold – instead, a debacle as unfunny as your VHS tape getting caught in the damned video player. Jerry (Jack Black) gets magnetized and accidentally erases all the VHS video tapes in his friend, Mike’s (Mos Def), store. Instead of doing anything remotely sensible – like re-purchasing all the videos in their catalog, or – how about this wacky outlaw idea? – purchasing DVDs (welcome to the twentieth century, Luddites)! – Jerry and Mike hit on the insensate idea to re-film all the video titles in their own inimitable, no-budget format. This is one of those films where you prime yourself to laugh because you love the comedians involved, and then that fake smile kinda freezes on your face after the first few stillborn non-jokes. By the time you realize you’ve been gypped by the funny trailers, you’ve already paid for the parking. The ludicrous, mildly funny concept of re-making iconic movies badly is not supported by the reality of the world we live in, because Jerry and Mike remake these movies banking on their poverty-stricken clientele (who still own VHS machines) to hold them up financially by hiring the re-made videos – but in this world where DVD technology (and now Blu-Ray) has superseded VHS outright, their base would dwindle exponentially, making their scheme a losing battle from the outset. There is potential galore for the plot to be an ingenious, inventive affair, but the film tries so hard to make us laugh that even Jack Black is floundering and unconvincing. Movie hits one salient point: Jerry’s and Mike’s remade films (which they call “sweded” – pertaining to some weak gag about Sweden) are only 20 minutes long, and they realize shorter films means more hires, means more income. Which is exactly the reasoning behind big studios supporting the “accepted” movie running time of 90 minutes. Longer running time means less screenings, means less income. It’s got nothing to do with integrity of the story or art or customers’ enjoyment. Only A-List directors even GET the budget to go “overtime,” so to speak, because their “brand” can still pull in that same amount of income that shorter movies do (and those movies are generally of better quality as a by-product of the funding). It’s a vicious, ornery circle of greed and filth. Under the illogical and inept storyline, there is an allusion to this YouTube generation; this coterie of losers will accept the lowest quality film-making as long as they are in it. Only for Jack Black completists, Mos Def fans, indie aficionados and people who can stand Danny Glover’s lisping without scratching their eyes out. Painfully long for a one-note idea, this movie would’ve worked better if Gondry had re-made it for no budget and with a running time of 20 minutes – SWEDED! Starring: Jack Black, Mos Def, Danny Glover, Sigourney Weaver, Paul Dinello, Melonie Diaz, Mia Farrow.